Exploring a Critical Net::Protocol Issue in Ruby 2.6.0p0 — It seems Ruby 2.6.0p0 introduced a serious bug if you do any HTTP communication from Ruby (using libraries like Net::HTTP, say) where certain payloads are getting corrupted. Luckily, a fix is in but we await a new official release so you may want to put off your production upgrades just for now. You Can Use Bundler Without a Gemfile — Did you know that it’s possible to use Bundler within a single Ruby script and without an external Gemfile? For some reason this had never occurred to me and it’ll be a game changer for my many single file scripts. 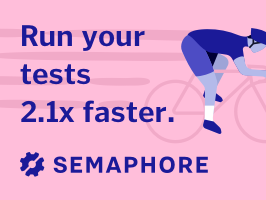 Run Your Tests 2.1x Faster on Semaphore 2.0. Pay as You Go — Sign up with GitHub, get $200 of free credit, and give it a spin. Creating Ruby Bindings and Extensions — A practical guide to going native with C. In this case, looking at how a developer built a way for Rubyists to use Uber’s H3 hexagonal geospatial indexing system. The Ruby Reference — An attempt to bring together and extend core Ruby documentation for Ruby 2.6 in one place. An Update on the Bundler 2 Release — Last week, we announced the release of Bundler 2 which depended upon RubyGems 3.0 - this requirement caused some issues so Bundler 2.0.1 (out now) relaxes the requirement to RubyGems 2.5. How Fast is the Released Ruby 2.6.0? — Ruby and Rails benchmarking enthusiast Noah Gibbs is back with some initial results from his process where rather than testing just Ruby itself, he tests a basic Rails app running on Ruby. Love to Pair Program? — BackerKit is hiring developers who LOVE pairing to join our agile team. Join us! Learn more about our team values here. Bindings and Lexical Scope in Ruby — A concise review of scope and bindings followed by how ERB templates leverage them. ▶ Using Action Text in a Rails 5.2 Application — I bet you thought you had to wait for Rails 6 to use Action Text, didn’t you? Common Mistakes That Cause Rails App Outages — Threads, database connections, timeouts, oh my! Active Admin Tips and Performance Optimizations — Active Admin gem is a popular tool for building admin interfaces in Rails apps. Debug Faster With Context Based Logging — When done right, logs can be your most powerful debug tool. Solargraph: A Ruby Language Server — A set of tools to integrate Ruby code completion and inline documentation into editors, such as VS Code. Ruby 2.6 Ubuntu Packages Now Available — If you’re on Ubuntu and want Ruby 2.6 packaged up nicely, you can thank the folks at Brightbox. pipe_operator: Elixir/Unix Style Pipe Operations in Ruby — It’s just a proof of concept.